As I mentioned in my last post, I have been experimenting in the kitchen. 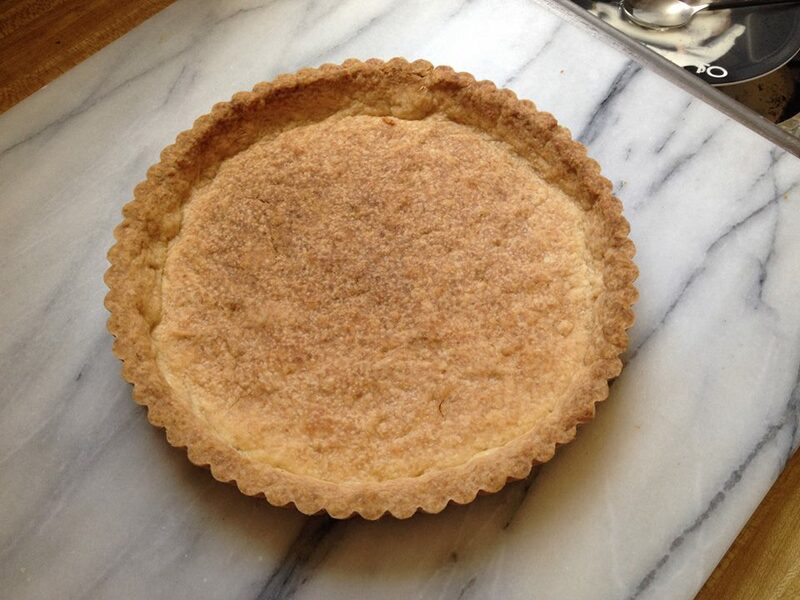 One thing I find difficult to find online is a good tart shell recipe! 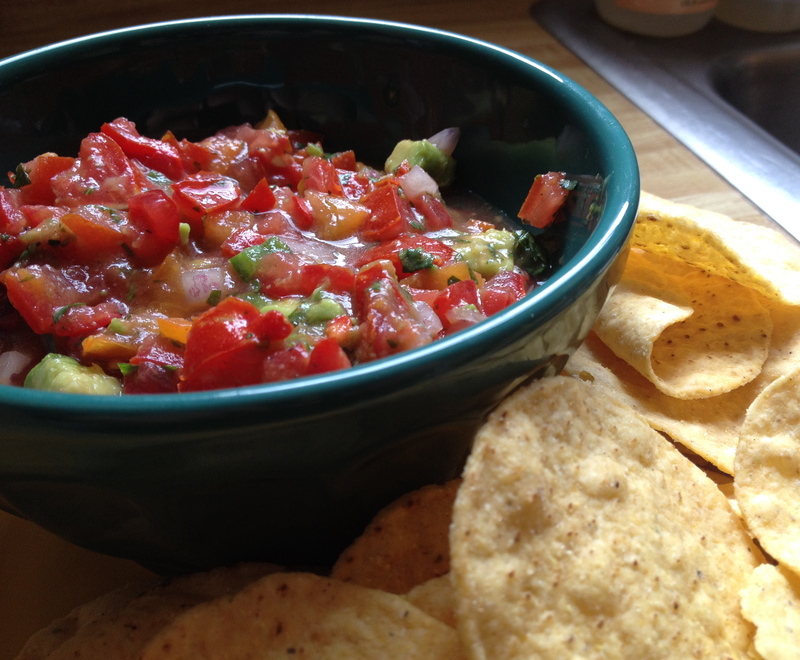 I have scoured my favorite food blogs and found many shells that perform very differently from the dairy ones I am trying to replicate. I decided to use some of my homemade Cultured European style butter in this recipe and compare it to Earth Balance Buttery sticks in the same exact recipe, changing only the butter. What I found was actually surprising. The Earth Balance sticks worked exactly like the dairy crusts I make at work. My homemade butter created a very different shell, one that cooked but stayed completely white and had more of a shortbread feel and less of a buttery crumbly tart shell. 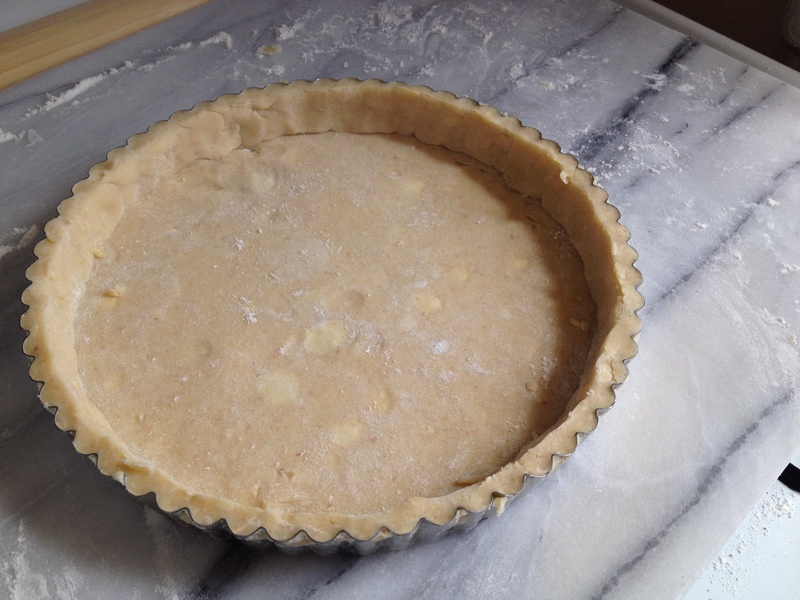 I may be posting this recipe prematurely because it isn’t perfect, you can’t just roll it out and plop it into the tart pan it is a bit more fragile than that. To combat this I have been rolling it out to about the width of the base of the tart pan and then pushing it up the sides to finish the shell. 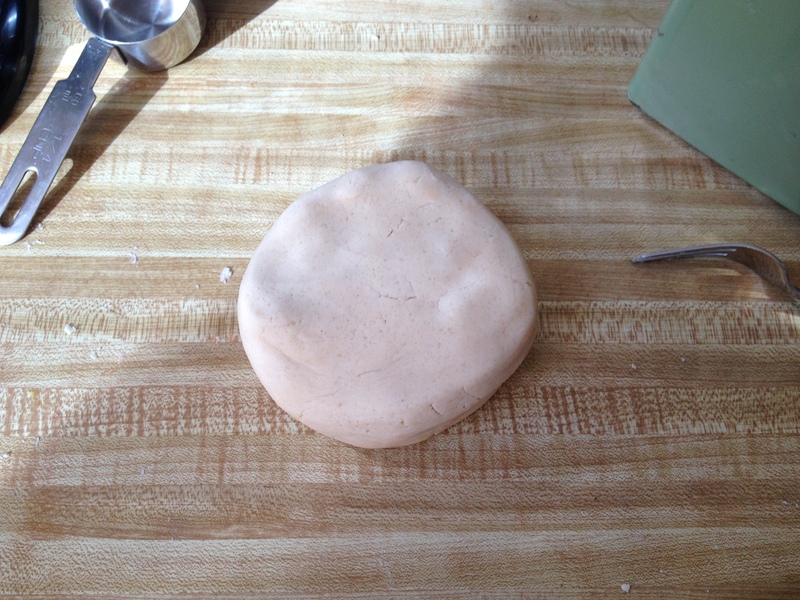 This allows the base to be flat and negates a mess of cracked dough all over your counter. 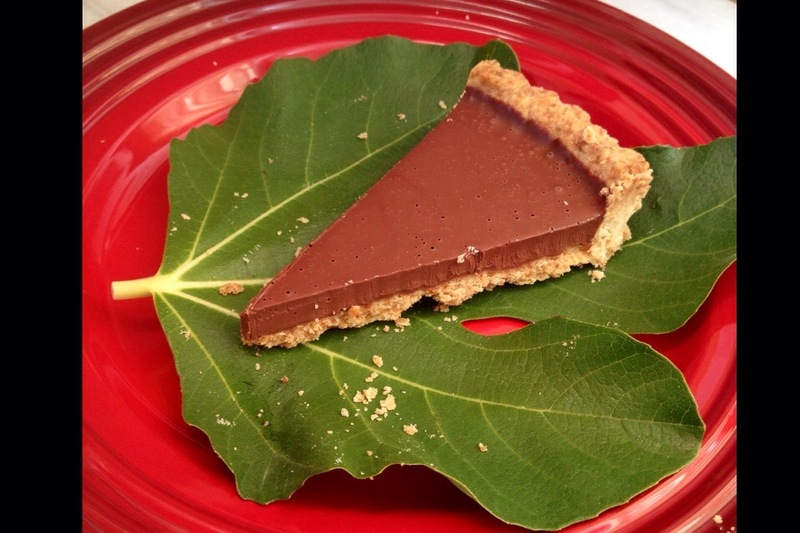 Use this crust recipe in any recipe that calls for a tart shell, and impress your vegan friends with a base that tastes just as amazing as whatever you put in it! One last note about this recipe: you will need a kitchen scale to make this. It is too difficult for some measurements not to be in ounces. 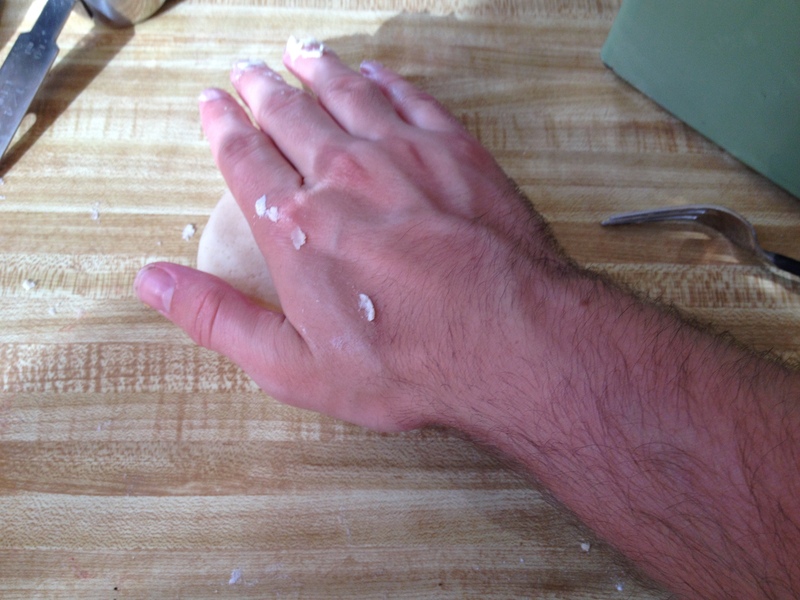 I made it this way so when you make it at home your shells comes out the same as mine. 1. First cube the Earth Balance and place it in the freezer. 2. 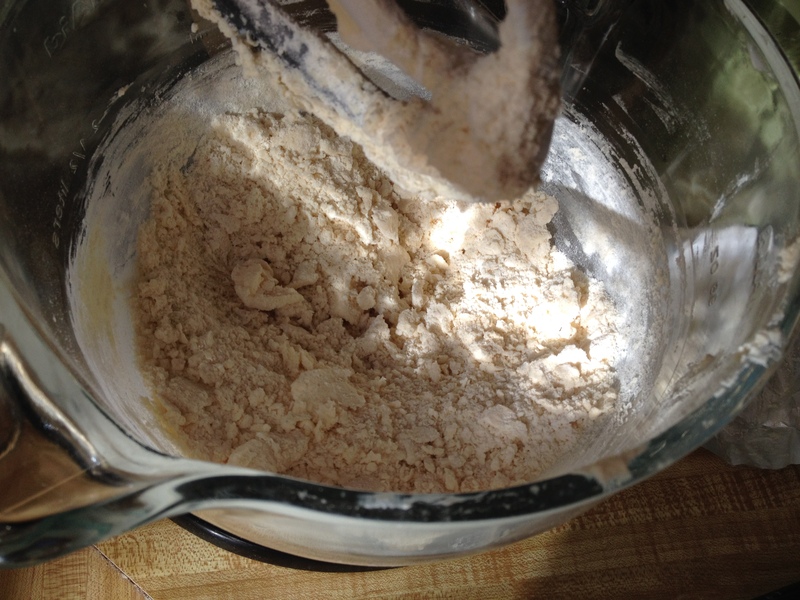 Next combine the flax meal and water and let sit in a small bowl to gelatinize. 3. 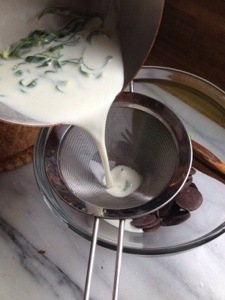 Place the sugar and Earth Balance in the bowl of a stand mixer with the paddle attachment and turn on low speed until combined but not whipped. 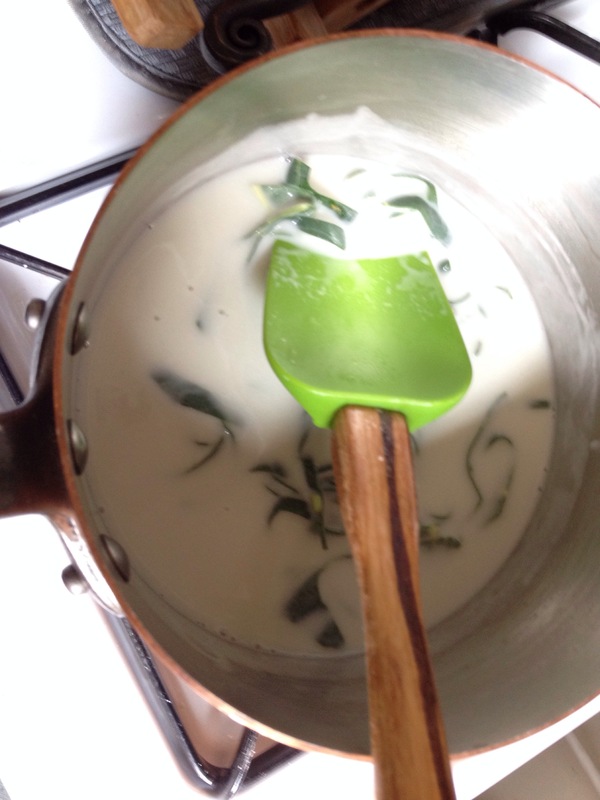 You just want the mixture to be homogenized. 4. Then add your dry ingredients and mix on low speed until its a corse meal. 5. Add your flax meal at this stage and watch the magic happen as that little added moisture and the binding power of the flax brings the mixture together. Mix until combined but take care not to over mix. There should be no crumbles left. Place on the counter and divide into three equal pieces. 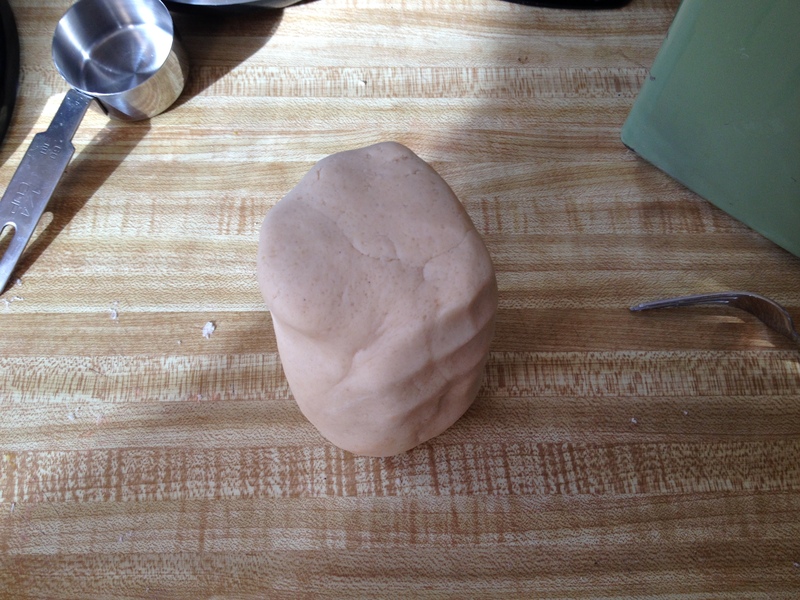 Weigh your dough to make this exact. Roll into rough balls. 6. Then roll into cylinders. 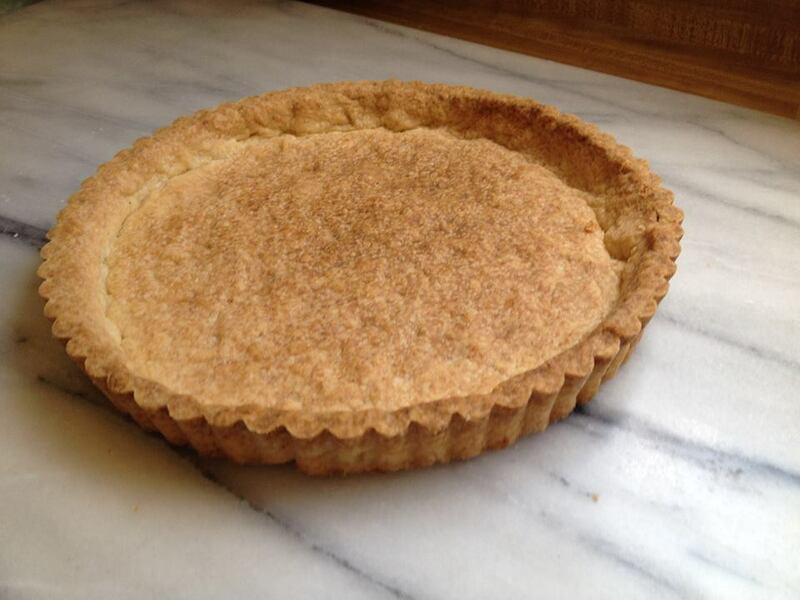 This is your tart crust. Place it in the fridge for at least an hour before rolling out, and place the other two in the freezer! 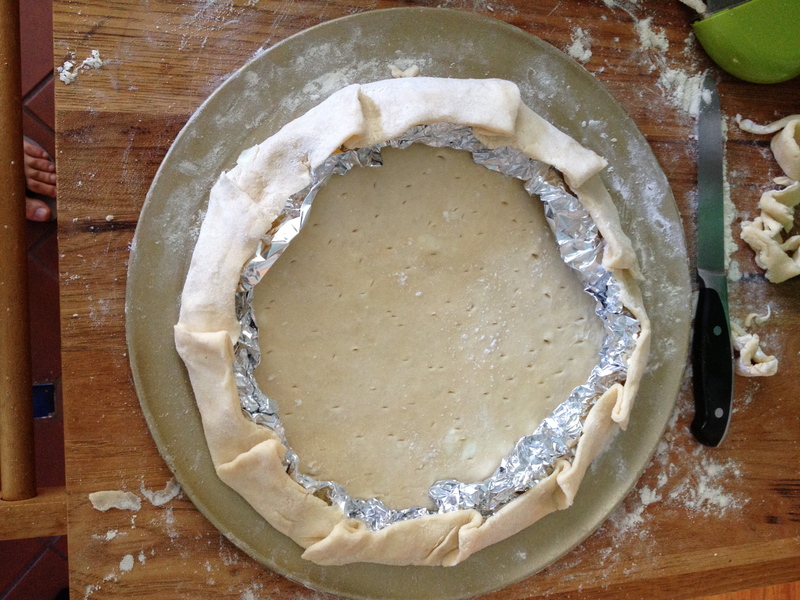 Roll the shell out to a managable base of the 9 inch tart shell and push it up the sides. 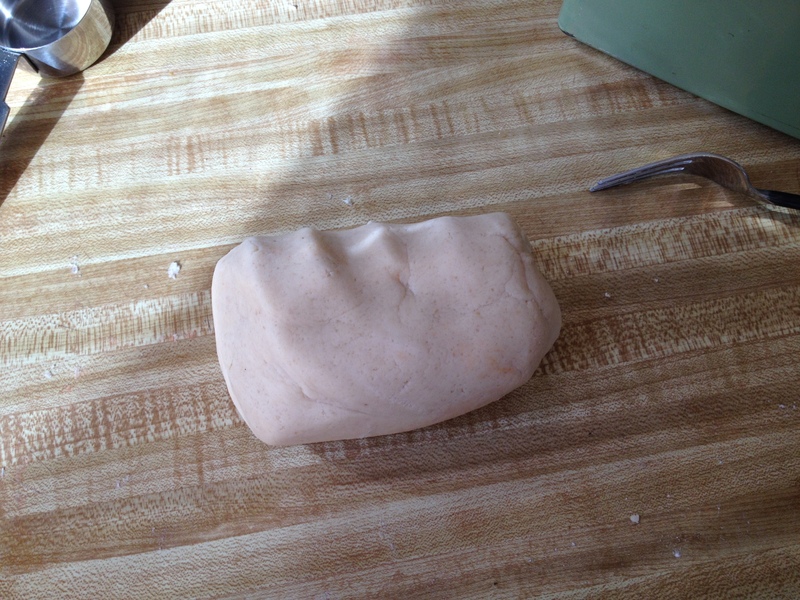 The only picture I have of an unbaked shell is from a failed tart shell recipe I was working on, but it gives you an idea of what your shall should look like in the mold. Bake at 350 until the shell begins to look like it has freckles. It is better to go a bit darker than have an under baked flour taste. But if you are going to be baking something in it after you par bake it, then bake a bit lighter than the picture below. 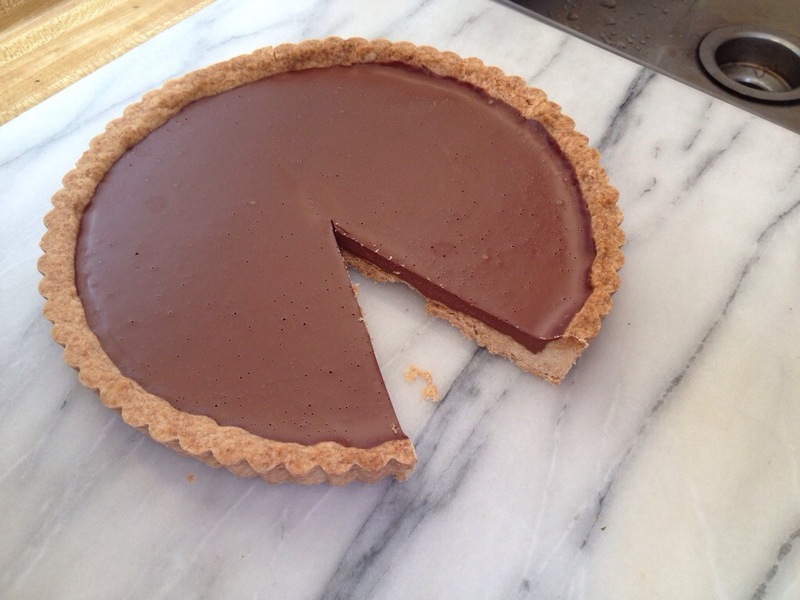 I won’t be further baking this shell because it will be a chocolate ganache tart and will set in the fridge. Recipe to come! Good luck and enjoy! Of all the egg replacers in the world I think that Golden Flax Seed might just be the most magical. The chemistry of eggs are quite different as they use proteins to bind, whereas flax uses polysaccharides. As soon as the polysaccharides are hydrated, in this case with water, a gel begins to form that binds together whatever you are baking. These polysaccharides are important in many baking applications even dairy related ones as they are found in everything from molasses to rice! This egg replacer should not be used for more than 3 eggs as it will give a distinct nutty flavor. Flax meal will create a grainy texture if used in something that should be creamy as it will create flecks of flax within it. 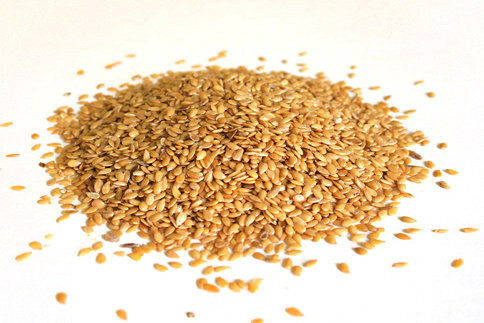 Do not use the brown flax seed as it will create a darker coloring in your baked goods due to the darker hull. First grind up the golden flax seed. I put about a cup of flax seeds in my coffee grinder and grind until a nice fine meal appears. This can be stored in the freezer for 6 months or in the fridge for about a month. I take what I need and place it back in the freezer. When grinding in your coffee grinder put something in the grinder first, like corn meal, and grind. This will take away the coffee flavor before you put your flax in and end up with coffee flavoring in all your baked goods! Take 1 Tbsp Flax Meal + 3 Tbsp water and mix well. Let sit for 5 minutes until it gels. Your flax is now ready for baking! We have all scoured the vegan section of our local grocer looking for different non dairy replacements for some of our favorite fixes (I am still waiting for vegan cottage cheese ;). But the honest truth is there are very limited options, EVEN in the bay area. 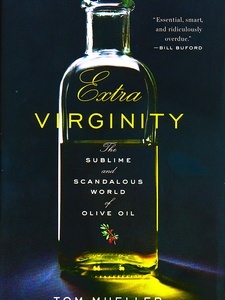 It’s why I began researching how to make my own vegan butter, I mean… who doesn’t love food science? A year ago I was making a good amount of money working for a non profit, and every wednesday after my meeting in San Francisco I would rush to Rainbow Grocery Collective to purchase any weird powder I could get my hands on knowing someday I would find a use and be able to utilize my ingredients. Xantham Gum is in everything from make up to salad dressing. It is perfect for gluten free baking because it is derived from sugar, and is a thickener/ emulsifier. It is created by fermentation of sucrose, glucose, or lactose…so make sure that your xanthan gum is produced by one of the first two. With regards to this butter it allows it to spread more easily. 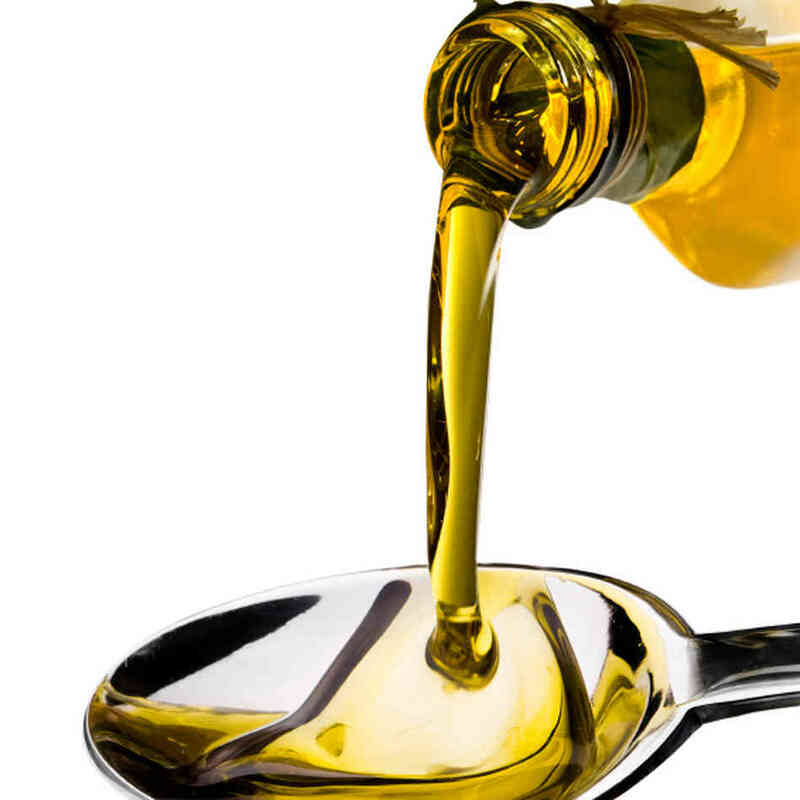 Lecithins are natural oils found in most plants and eggs. Everyone seems to cringe nowadays when they hear the word soy, it has such a bad rap. The truth is that, yes, the plant is dangerous but only in the hands of companies like Monsanto. Soy lecithin like xanthan gum is in most products, especially chocolate. It has emulsification properties which means that it “holds” the chocolate together. Make sure when sourcing that you are finding soy lecithin that is non gmo. In regards to the vegan butter it helps keep it together. 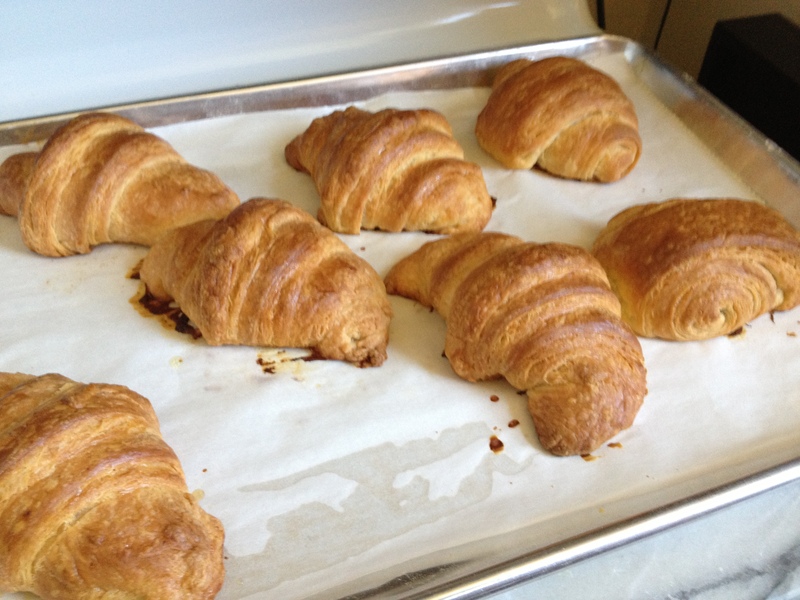 I have a coworker who is obsessively asking me for vegan croissants, and to be honest, I can’t blame him! The last time he got vegan croissants was in Paris. 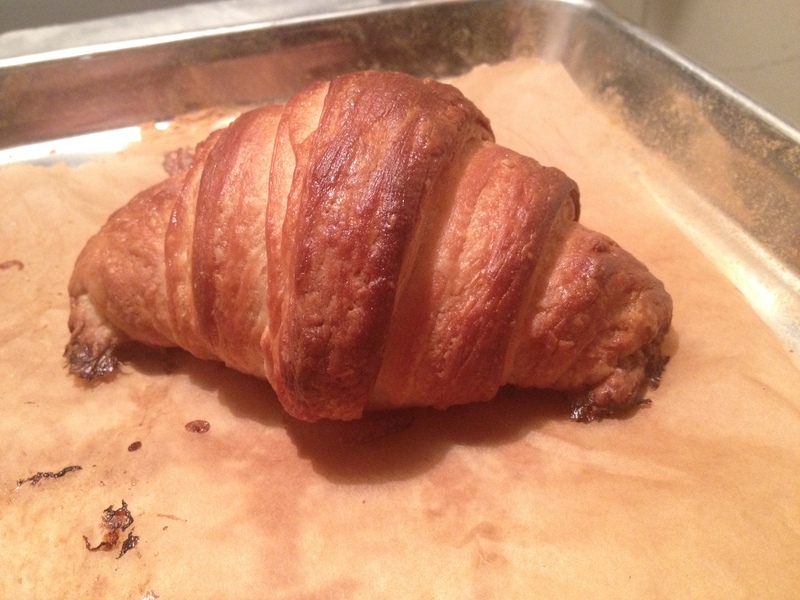 Don’t get too excited as I will not be posting a croissant recipe until I fully understand the fundamentals. 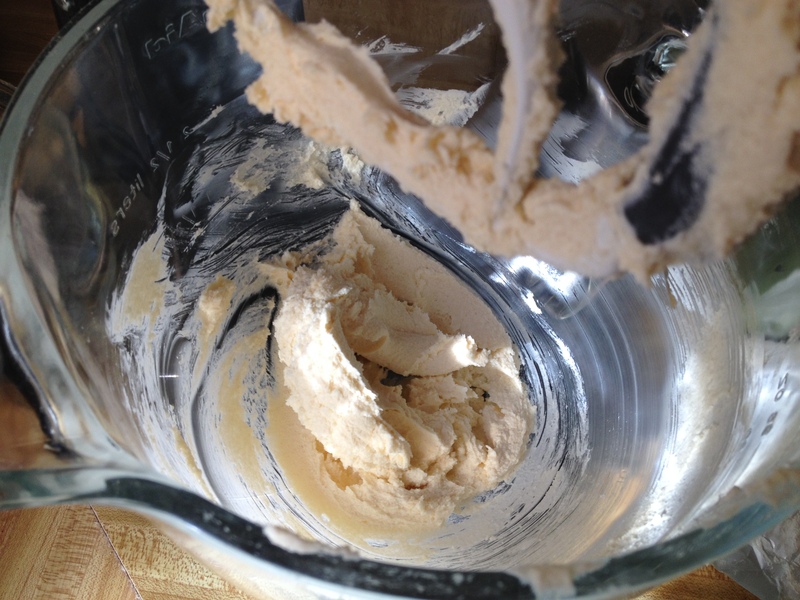 To create the vegan croissants for his order I have been experimenting with various vegan butters, and most of the work has already been done. There is a man in brooklyn who has created a whole plethora of vegan butters that you can make at home. I rushed off to the store yesterday so I could make some European style cultured butter with some yogurt, but when I opened the yogurt I found something very different from the creamy deliciousness I was looking for. In the mood to make butter I switched my game plan to this White Chocolate Vegan Butter, the perfect accompaniment to toast, or inside some danishes. 1. 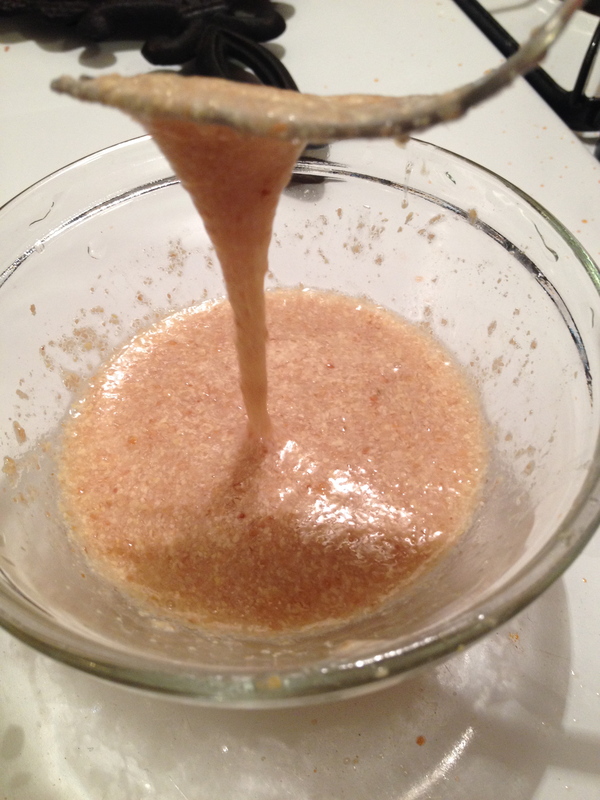 Mix the soy milk, vinegar, and salt in a small bowl. Whisk with a fork and let sit for 10 min to curdle. 2. Meanwhile melt the cocoa butter in a small saucepan and turn off when you have a few chunks left as to leave the temperature as close to room temp as possible (this will make for a softer butter). 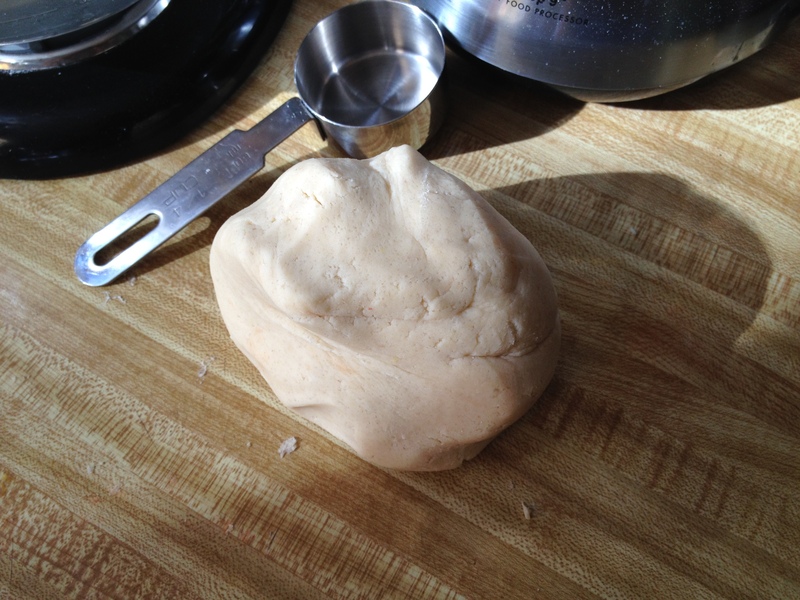 Let sit until all chunks have melted and the mixture is homogenous. 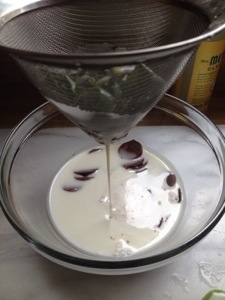 Add the cocoa butter and canola oil to a food processor. 3. Add the soy mixture as well as the rest of the ingredients and turn on the food processor for 2-3 minutes scraping down the sides of the bowl twice. 4. 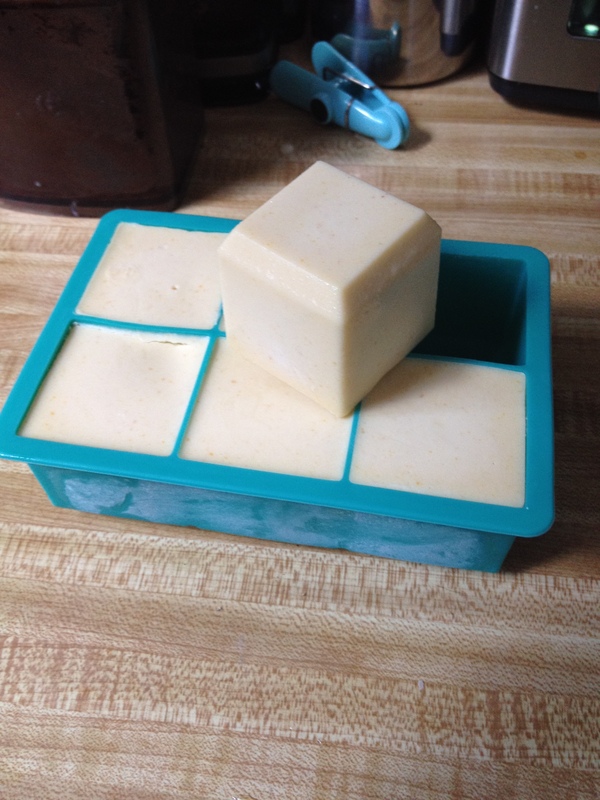 Pour into a mold (see above picture) and place in the freezer. The butter should be ready to use in about an hour. 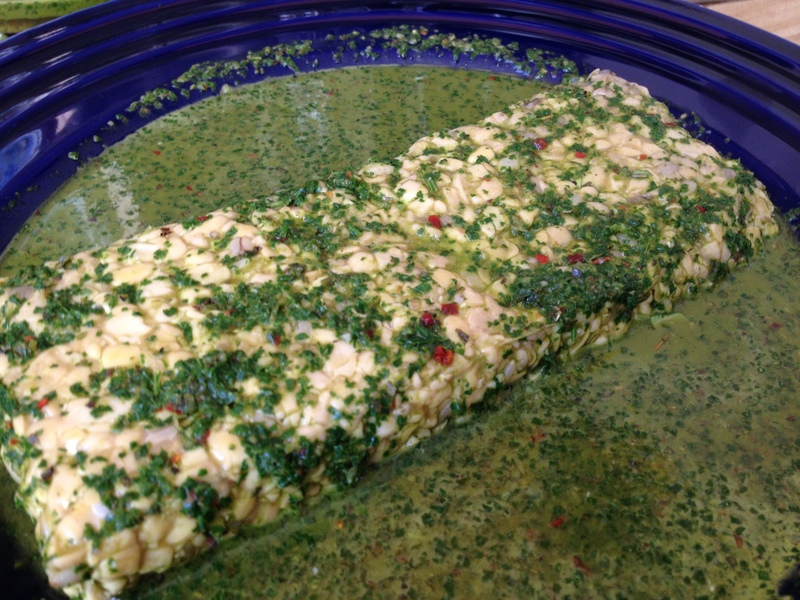 Store in an airtight container for 1 month in the fridge or in the freezer for a year! Makes 2 vegan butter sticks. 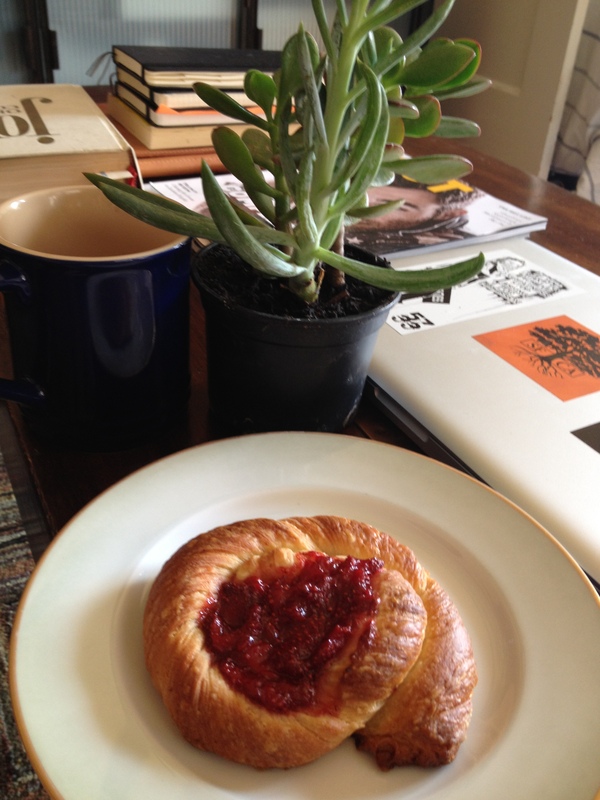 When I make butter at home, I love to make Danishes. I might just use this butter in a pie crust or a pan au chocolate. 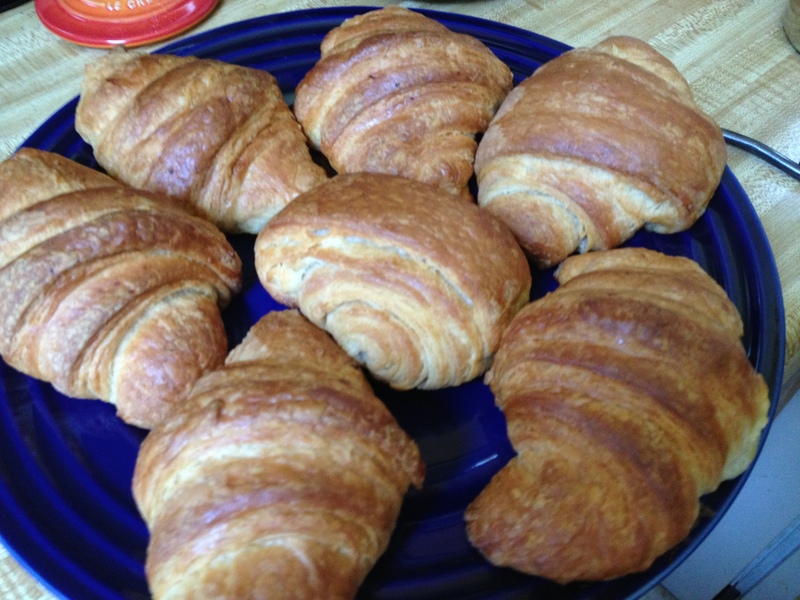 Here are some of my first croissants which will appear later on my blog!